Rioters broke into a U.N. base in Congo's capital Thursday and besieged peacekeepers opened fire, killing two. Tens of thousands of protesters mobbed the streets, blaming the United Nations for the rebel takeover of an eastern city. The fall of the eastern border city of Bukavu threatens to plunge the Central African country back into civil war. In an attempt to defuse the crisis, rebel commanders said Thursday they would withdraw from Bukavu and return it to the control of the United Nations and the central government. A U.N. spokesman in Bukavu said it was not yet clear whether the promised withdrawal had begun. The announcement of the planned pullout came hours after protests — the largest seen since 1997 — threw the capital into turmoil. Masses of Congolese flooded the streets on Kinshasa, marching on the main U.N. headquarters and other facilities. Rioters burned tires and grabbed clubs as they surrounded the buildings, while U.N. troops holed up inside fired tear gas and Congolese police shot into the air. "The state is dead!" mobs chanted at one of numerous protests filling the city after daybreak. "We will punish (U.N. forces) ourselves!" Mobs broke down the door at the U.N. logistical base outside the city center, streamed inside and began to loot, U.N. Congo mission spokesman Hamadoun Toure said. U.N. troops guarding the building opened fire, killing two protesters and wounding another, Toure said. "We regret this deeply because our mission was to establish peace in the country but we were left with no choice," he said. The rioters blame the 10,800-strong U.N. force in Congo for failing to stop Wednesday's capture of the eastern border city of Bukavu by renegade commanders once allied with neighboring Rwanda. Bukavu's fall threatened to wreck the fragile peace process that ended the 1998-2002 civil war, bringing in the U.N. force and creating a transitional, power-sharing government. President Joseph Kabila on Wednesday night accused Rwanda of backing the seizure of Bukavu and declared a state of emergency. Rwanda and the rebel commanders in Bukavu denied the Congolese president's accusations that Rwanda was behind the uprising in the city. Speaking on state-run Radio Rwanda Thursday, Foreign Minister Charles Muligande said Kabila's allegations were unfounded and that Kabila was hiding his shame that his troops had been defeated. U.N. officials in the region also said they had no evidence of any Rwandan involvement. In Bukavu, renegade Gen. Laurent Nkunda said he would withdraw his forces from the city, more than 900 miles northeast of the capital, insisting he had only captured it because the regional military commander assigned by the Kinshasa government had been persecuting one of the local tribes. "We shall withdraw to reorganization centers to assure the transitional government that we are not opposed to it," Nkunda said. "We are just opposed to the persecution of one section of the Congolese community." Col. Jules Mutebutsi, who joined Nkunda in seizing the city, also told The Associated Press that he is pulling out his troops. He said Congolese military police loyal to him and Nkunda would patrol the town along with U.N. peacekeepers. U.N. spokesman Sebastien Lapierre, though, said he could not confirm the plan. The commanders launched their revolt complaining that regional commander Brig. Gen. Mbuza Mabe was mismanaging security and persecuting members of the Banyamulenge community. Nkunda accused Mabe loyalists of causing unrest in the city and insisted his forces were trying to keep security. U.N. medical workers at a Bukavu clinic treated three women — including a 15-year-old and a pregnant woman — for severe injuries after being raped early Thursday. Residents threw stones at U.N. vehicles and threatened to lynch U.N. workers in Bukavu's Kadugu neighborhood, which was especially hard hit by the renegade soldiers. 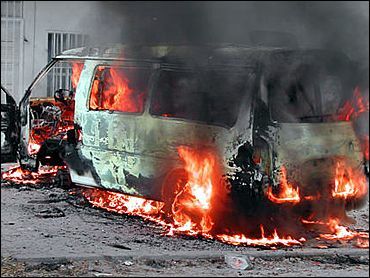 In the northeastern city of Kisangani, students demonstrated and tried to set fire to a U.N. post and two U.N. vehicles. Congolese soldiers fired shots into the air to disperse the protesters. Rwanda was Congo's chief adversary in the civil war, which drew in the armies of six nations and killed an estimated 3.5 million people through violence, famine and disease. The civil war was an outgrowth of the 1997 ouster of Congolese dictator Mobutu Sese Seko, when the country was known as Zaire. Rwanda and Uganda supported Laurent Kabila in deposing Sese Seko. When Rwanda and Uganda suspected Kabila of giving sanctuary to Hutu rebels — linked to the 1994 Rwandan genocide — in eastern Congo, they supported armed incursions by rival rebel groups. Burundi also sided with Rwanda and Uganda. Angola, Zimbabwe and Namibia backed Laurent Kabila. He was assassinated in 2001, and his son Joseph took over.